If Queensryche had come out of Finland, this is what they would have sounded like. 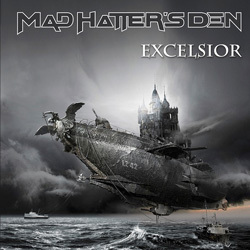 Formed in 2010 Mad Hatter’s Den have refined their sound over one album (2013’s ‘Welcome To The Den’) and a couple of singles and now they’re up-and-running with their second full-length outing ‘Excelsior’. Not an album to be taken lightly, or to under-estimate, ‘Excelsior’ is a metal fan’s dream: the eleven cuts on offer are, at face value, easily accessible, hugely melodic, and hit the spot nicely from the off; dig a little deeper, however, and you’ll appreciate how the band have imbued each and every song with a profundity to satisfy even the most die-hard critique of how to compose creative, exciting and (above all) enduring songs. Without singling anyone out for too much attention – this is a band which is way, way more than just the sum of its parts – vocalist/bassist Jarno Vitri (who only originally joined to supply the bass runs) has a fabulous voice which really gives the material an added dimension. Guitarists and founder members Jaakko Häninen and Kari Korhonen trade licks and hop from workmanlike riffs to flashy leads and back again at the drop of a hat(ter), keyboard player Petja Puumalainen hogs the spotlight whenever required then drops back to providing a canvas for his bandmates to colour, and relative newcomer Arto Pitkänen keeps things tight at the back. When the guys push the pedal to the metal they do tend to exhibit an admiration for Iron Maiden, and if ‘Trail Of Tears’ does find the band living on a razor’s edge they never quite fall into Steve Harris’s territory. But that’s just a minor quibble – and in fact could easily be a major plus-point for many metal fans. Songs like the driving ‘Hero’s End (At The Silver Gates)’ and the more commercial ‘Birds Of Prey’, with its eminently catchy chorus, twin guitar breaks and pulsing keyboards, probably bookend the album’s range, ‘Masters Of Hate’ is as in-your-face as it gets without starting a fight, and if every metal album had a song as classy as ‘The Aftermath’ the world would be a much better place. Trust me on this. From its stunning artwork to the dying notes of album closer ‘Not Of This World’ ‘Excelsior’ is an electrifying release and an album which demands close attention. Lewis Carroll’s Mad Hatter might be stuck in time, but on the strength of ‘Excelsior’ Mad Hatter’s Den have an exhilarating future waiting to unfold.